Family-owned business, serving delicious fresh food daily. 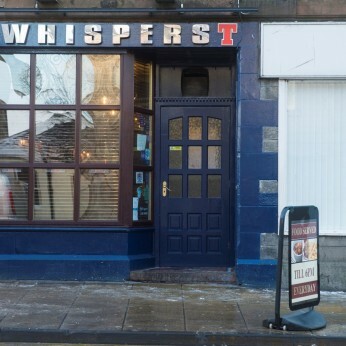 Whispers is a family owned pub in Tranent that has been a popular place for locals and visitors alike to relax and enjoy tasty pub food, entertainment and beverages since 1986. Conveniently located on the High Street you can always expect a warm welcome at Whispers Pub. Whispers serves tasty pub food at great prices. From light snacks, lunch or a three course dinner, we have something for all taste buds to enjoy. We're really sorry but we don’t seem to have any offers or events for Whispers Lounge Bar. We're sure there must be something happening here but they just haven't told us about it! Please do mention this to Whispers Lounge Bar when you next visit them.